Many pedestrian bridges around the world have experienced dramatic vibrations and dangerous wobbling when crowds of pedestrians have tried to cross them, with some bridges falling down. In 2000, the London Millennium Bridge began to sway on its opening day as thousands of pedestrians crossed it and the $32 million bridge had to be closed. In 2003, the Clifton Suspension Bridge in Bristol, U.K., originally designed as a highway bridge, had to be closed when it started wobbling sideways abruptly as a crowd crossed it during the International Balloon Fiesta. In 2014, the Squibb Park Bridge in Brooklyn, N.Y. bounced from side to side as pedestrians crossed the bridge and didn't reopen until early 2017. The Singapore Airport's Changi Mezzanine Bridge is another example of an unstable pedestrian bridge. "In this Science Advances paper, we reveal this threshold effect and show this is a general phenomenon for bridges," said Dr. Igor Belykh, professor in the Department of Mathematics and Statistics at Georgia State. "We challenge the widespread view that increasing the crowd size will gradually increase the bridge wobble. The current view is the more pedestrians we add to the bridge, the wilder the oscillations will be. This is true, but only for crowd sizes above this critical size. There is an important threshold effect. "Our paper gives an explicit guideline and formula of how to estimate this critical crowd size, which can be used to limit the carrying capacity of an existing bridge and to help designers build better bridges. The biomechanical models we're developing are particularly important for understanding the role of crowd dynamics on a wobbly bridge because the U.S. code for designing pedestrian bridges does not contain specific guidelines that account for collective pedestrian behavior. The industry standard programs used by bridge designers only use linear models. We're working on the inclusion of biomechanical models like ours into the standard tools and software programs used by bridge designers to better predict the nonlinear effects associated with the interaction between crowds of pedestrians and bridges." Previous studies have found a connection between critical crowd size and bridge wobbling. Engineers determined the London Millennium Bridge would sway if a critical crowd size of 165 pedestrians crossed the bridge at once, but under the critical size there were no vibrations. In addition, engineers discovered a critical crowd size for the Clifton Suspension Bridge, saying that once the crowd reached the critical size, wobbling became noticeable and dangerous. This threshold effect is likely to be present for other bridges, Belykh said. The biomechanically inspired models of pedestrian response to bridge motion developed by the researchers can be used as "crash test dummies" when numerically testing a specific bridge design. The models, based on the inverted pendulum, imitate human lateral balance. The paper finds that synchronization of pedestrian foot movement might not necessarily be the main cause of the initiation of bridge vibrations, though it is necessary for the bridge to sway significantly. It is commonly believed that synchronization among pedestrians initiated the wobbling on the London Millennium Bridge, but this paper argues otherwise. 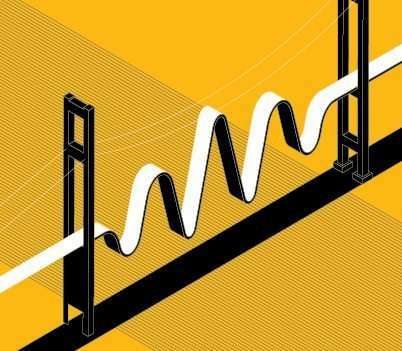 The initiation of bridge wobbling without synchronization was previously observed during periods of instability of the Singapore Airport's Changi Mezzanine Bridge and the Clifton Suspension Bridge. Both bridges experienced crowd-induced vibrations at a bridge frequency different from the average frequency of the pedestrians, while the pedestrians continued to walk without visible synchronization. In previous work published in Chaos: An Interdisciplinary Journal of Nonlinear Science, Belykh studied the interaction between pedestrians and bridges and found this interaction can make the pedestrian walk with two distinct lateral gaits. Both gaits can correspond to pedestrians walking out of phase with the bridge, but one gait is more dangerous because it produces significantly larger bridge oscillations. These findings could shed light on the strategy mountain climbers should use when crossing lightweight, wobbly bridges with a heavy backpack, such as the metallic ladders required to cross giant crevices at Mount Everest. The extra weight of the backpack could cause abrupt vibrations, so the paper recommends for climbers to send the backpack over the bridge separately using ropes. Why did the London Millennium Bridge 'wobble'?